With 2016 being the hottest year ever recorded on earth the impacts of climate change on tropical marine habitats such as coral reefs, seagrass and mangroves have been widespread around the world. These habitats are of vital importance to the continuation of life on earth as we know it, so learning how to conserve these centres of biodiversity and marine productivity in a changing environment has never been more important. 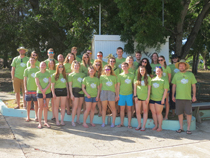 ‌‌With this in mind 24 Swansea University students studying for degrees in marine biology, zoology and biology embarked on a two week tropical marine biology study trip to Puerto Rico. 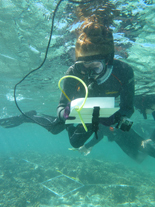 Based at the Isla Magueyes, University of Puerto Rico the students conducted short team research projects on aspects of the ecology of tropical marine ecosystems (Predation, herbivory, Fish adaptation, habitat connectivity, reef fish ecology). The study module is led by Swansea University academics Richard Unsworth and Nicole Esteban with assistance from Penny Neyland, Ed Pope and Ian Horsfall. 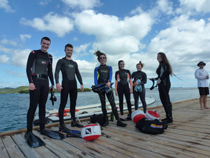 For more information about the Swansea University Tropical Marine Biology Field Trip go to http://www.swansea.ac.uk/biosci/undergraduate/tropicalmarinebiologyfieldtrip/.